The Madrugada trail is a paved, one-way trail with easy terrain and easy changes in elevation. 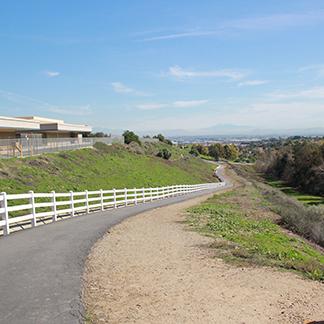 The trail travels along the hillside near Canyon Hills Jr. High and Rolling Ridge Elementary schools on the hillside north of Grand Avenue. The trail has limited views of the Chino Valley, Payne Ranch Center, and Grand Avenue. The Madrugada trail ends at Grand Avenue and the Payne Ranch Center.